Using Panasonic projectors actually gives us creative freedom, because it means we can focus on the artwork. You need the equipment to just do what it does and do it well. Over £18 million has been spent over the last decade restoring the intricate, historic stained-glass windows that draw thousands of visitors to York Minster every year. Such sums mean that fundraising is a full time job for the gothic cathedral, parts of which date from 1225. 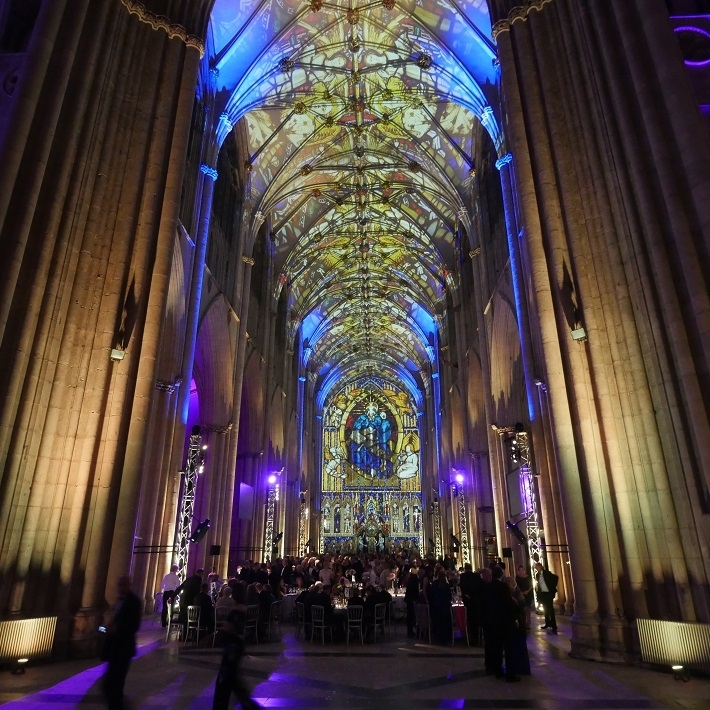 In June 2018, a video projection and sound installation was commissioned by the York Minster Fund as the culmination of The Northern Lights Dinner fundraiser. "To see the dragon, coming to life like that with fire coming out of it's mouth was wonderful." 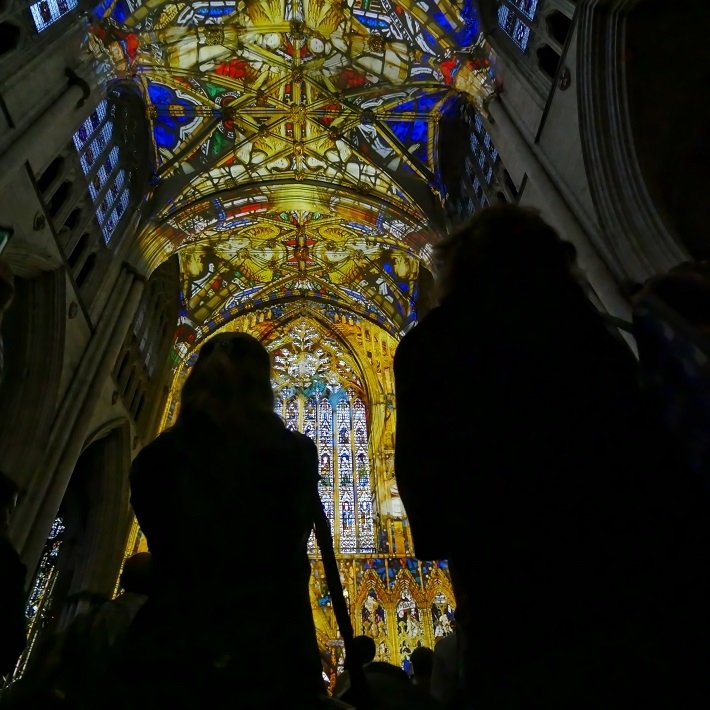 Part of a four- year campaign to build an on-going endowment for the protection and restoration of the Minster’s historic glass, artists Ross Ashton and Karen Monid were invited to deliver an immersive and intricately crafted sonic and visual work - Northern Lights. Ross & Karen of the Projection Studio are world renowned for their projection and audio artworks. Their style of mixed-media 'installation performance' has developed over a series of innovative projects at many different locations. They worked at the Minster in 2010 when they produced Rose, another spectacular artwork which focused on the celebrated Rose Window. They have also created other artworks for the Illuminating York festival in 2008 & 2013. The 10-minute artwork was seen by an audience of 700 at the Northern Lights dinner. This was followed by two days of performances with the Minster being opened to the public at dusk each night. This allowed another 3,300 people to see the artwork. "Using a historic building with a very modern technology inspires more people to come and appreciate this space." The content was inspired by intricate details within the glass artwork, which are then blown up at a scale to make a great visual impact within the architecture. Cristopher Norton from York university (Minster’s Glass Advisory Group), said, “I’ve been working on these windows for ten years now, so I know the images extremely well. To see the dragon, coming to life like that with fire coming out of it’s mouth was wonderful. The projected images covered the entirety of the 65 x 20m nave vault and West Wall. “It’s such an iconic building, it’s got fantastic heritage. 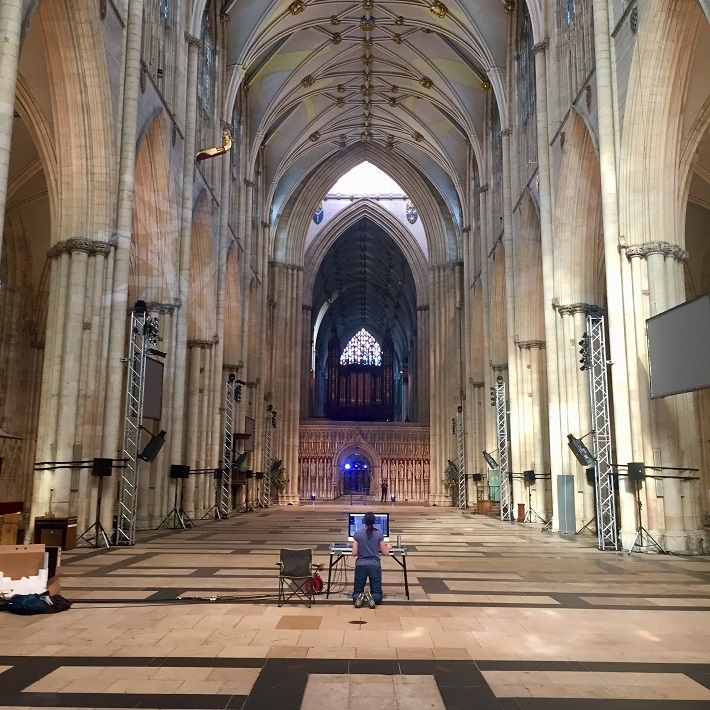 So it was a real honour to bring such a light show in to the Minster, where it has never been seen before,” said Karen Monid, Sound Artist, The Projection Studio. 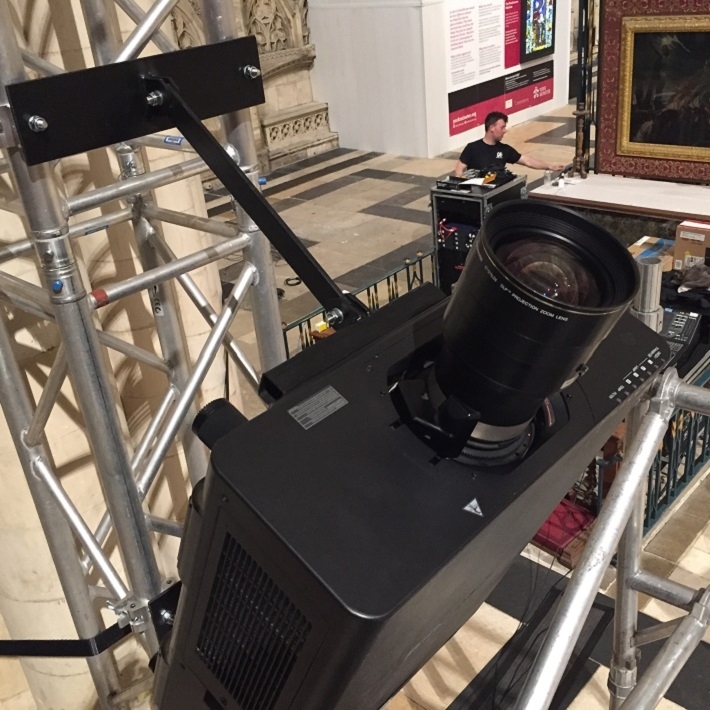 Ross used eight blended projectors to achieve the roof images and another three for the end wall, all Panasonic PT-DW17K. “Using Panasonic projectors actually gives us creative freedom, because it means we can focus on the artwork. You need the equipment to just do what it does and do it well,” added Karen. Ross devised a customised cradle for the nave projectors so they would point 15° off the vertical and almost directly up into the roof. The three West Wall projectors were rigged on a structure built beneath the organ on the opposite end of the nave. The compact nature of the PT-DW17 makes them ideal for this type of application, meaning more space for guests. The fully mapped projection was controlled by Dataton Watchout, programmed by Richard Kenyon. "We were very pleased with the show and were quietly confident that it would be received well by the public," comments Ross. "But we were all completely overwhelmed by the enthusiasm and extent of the response, and with just how much people appreciated seeing such a well-loved landmark in a completely different light through the piece." Neil Sanderson, adds, "The Northern Lights spectacular exceeded all our expectations. 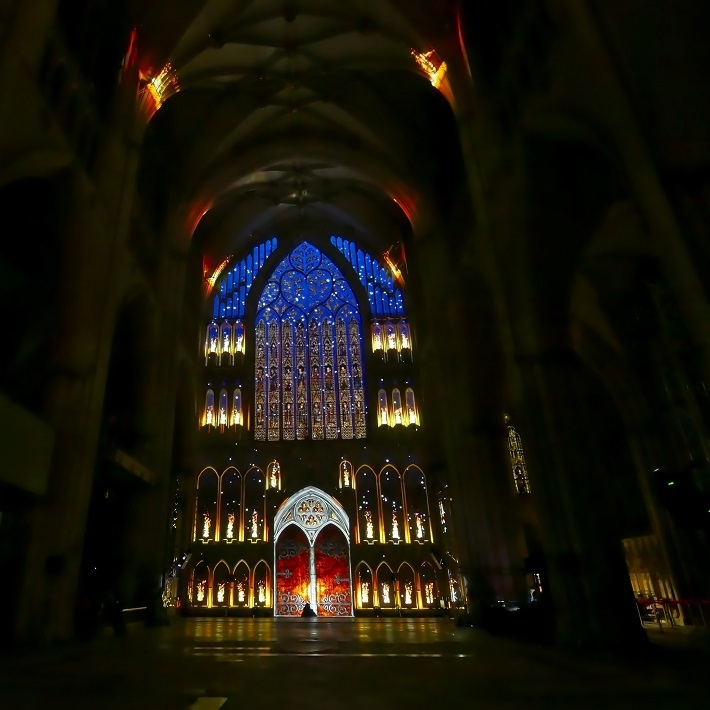 The combination of projected imagery, spoken word, and music perfectly complemented the cavernous space of the Minster and using imagery of the medieval windows, the installation brought a whole new audience to the eternal truths they contain. The reaction of the sell-out crowds was testament to the quality of Ross and Karen’s work."